Football may be the king of sports in Germany, but basketball is right on its heels in Deutschland when it comes to social media. That is the finding of a study that analyzed the collective social networking of 94 sport organizations. The Macromedia Academy for Media and Communication (MHMK) in Munich used 34 different criteria to study the first and second division football clubs in Germany, the first division clubs in handball, basketball and ice hockey as well as the four sports’ league bodies and their national federations. The social media champion in Germany sports turned out being football club Werder Bremen with fellow football Bundesliga side Hannover 96 in second place. “This is a great honour for us. It shows that we are taking the right path and the mix of informational and entertainment content as well as questionnaires, competitions and participatory actions is right,” Werder Bremen media director Tino Polster said on the team’s webpage. Basketball took over after that point with Alba Berlin placing third ahead of the German basketball league BBL while Telekom Baskets Bonn were ranked seventh and Fraport Skyliners eighth. All told, eight basketball clubs or organizations were ranked in the top 20 – the others being Brose Baskets Bamberg (12th), s.Oliver Baskets Würzburg (13th), ratiopharm ulm (14th) and Bayern Munich (18th). “We are very happy about the results. They underline that both the league and the clubs have taken the right steps in the Social Media area and continue to do so,” said BBL league CEO Jan Pommer. Football clubs made up 11 of the top 20 with freshly crowned handball Champions League winners THW Kiel the only representative from handball or ice hockey. “Altogether it was determined that the majority of the sports organizations researched have need for improvement regarding social media because the opportunities for communication with the target groups that social media platforms offer is either entirely ignored or not entirely exploited,” concluded the study, which was called Social Media in Professional Sports. 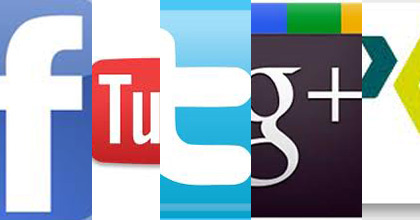 For the 33-page case study, the MHMK chose Friday May 11, 2012 at 5 p.m. to look at how the sports organizations used the five largest social networks: Facebook, YouTube, Twitter, Google+ and XING. The networks were ranked in weighted order and the researchers used a five-point scoring system (5 best, 0 worst) regarding the quantity and quality of social media usage. Only official social network sites from clubs and organizations were studies – no fan sites. The Facebook winners with a ranking of 4.1 were football clubs Werder Bremen and Schalke 04 as well as basketball teams Bayern Munich and ratiopharm ulm. All 18 BBL clubs had a Facebook site. ratiopharm ulm took top overall honors in YouTube with a 4.7 score. It was clear to see that basketball bosses in Germany are taking advantage of the online video network better than any other sport. Of the top 11 ranked organizations, nine of them were from the basketball world. And 15 of the 18 clubs had YouTube sites. A basketball club was tops in Twitter as well as Alba Berlin had the highest ranking of 4.8, just ahead of Werder Bremen (4.7). And 17 of the 18 BBL teams were using the short message service Twitter. The study showed that Google+ and XING had a much lower ranking among the 94 organizations as only 37 of them had a Google+ presence. And the top performers were Werder Bremen and VfB Stuttgart with a score of 4.0. Only five of the 18 German BBL teams were on Google+. XING had an even lower standing with just six total organizations represented in the business platform – second division football side Eintracht Frankfurt, handball clubs HSG Wetzlar and Rhein-Neckar Löwen, basketball club Fraport Skyliners and the German basketball league BBL and basketball federation DBB. HSG Wetzlar and Rhein-Neckar Löwen, Fraport Skyliners and the BBL are the only four organizations that had a presence in all five social media networks. That helped HSG Wetzlar place 21st overall and Rhein-Neckar Löwen 22nd. At the other end of the spectrum, second division football club SG Dynamo Dresden, handball side Eintracht Hildesheim, the German Football Federation and the German Handball Federations were the only four organizations with zero representation in the five social media areas. The poor showing of the German football league and federation disappointed the researchers, saying they are missing an excellent chance to communicate more with their fans. “The results of the study can help clubs to continue to optimize their social media activities,” said MHMK professor Andre Bühler.